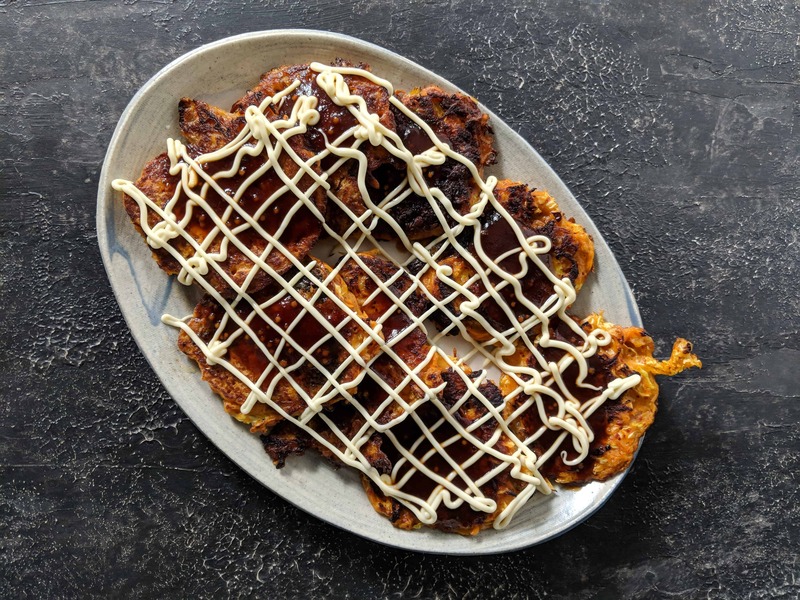 I came up with this riff on okonomiyaki (Japanese pancakes) because I am always looking for new ways to eat kimchi, Korean fermented cabbage, which we show you how to make here. You can also buy it, or just leave it out – the pancakes are great anyway. In its simplest form, okonomiyaki are savoury cabbage pancakes. But the very word ‘okonomiyaki’ means ‘whatever you like, fried’ so there’s permission in the name to adapt. Make your own tweaks: add cheese, frozen peas, chopped celery, prawns, sausage, ham or leftover chicken. Seriously, just go for it! Serve the pancakes with the sauce below and Kewpie mayonnaise. Something else I love about this recipe is using the different Thermomix Reverse speeds to chop the cabbage and carrots. If you’re cooking without a Thermomix, see the Traditional Method below. 1. Place cabbage in mixing bowl and chop 8 sec/Rev/speed 4. Set aside. 2. Place carrot in mixing bowl and chop 10 sec/Rev/speed 5. Set aside with cabbage. 3. Place flour, tamari, eggs, water and oil in mixing bowl. Mix 20 sec/speed 4. 4. Add kimchi, spring onions (shallots), corn kernels and cabbage mixture to mixing bowl. Mix 30 sec/Rev/speed 3. 5. Heat vegetable oil in a large non-stick pan over medium-high heat. Ladle fist-sized portions of mixture into the pan to make pancakes of about 2 cm (1 in) thickness, or whatever size you like. Cook for about 3 minutes each side or until golden brown. It’s better to cook the pancakes slowly so they cook all the way through. Add oil between batches. While pancakes are cooking, make the sauce. 6. Place garlic and ginger in mixing bowl and chop 4 sec/speed 7. Scrape down. 7. Add other ingredients and cook 10 min/Varoma/speed 1, with measuring cap removed and steamer basket placed over mixing bowl lid, or until the sauce is reduced to a glossy pouring consistency. Strain the sauce into a jug for pouring onto pancakes. Serve okonomi-kimchi drizzled with sauce and squiggled with mayonnaise. 1. Shred cabbage, either by thinly slicing it or grating it. 2. Grate carrot and set aside with cabbage. 3. Place flour, tamari, eggs, water and oil in a mixing bowl and mix until smooth. 4. Add kimchi, spring onions (shallots), corn kernels and cabbage mixture and stir through until combined. 6. Finely chop garlic and ginger. 7. Place all ingredients in a small saucepan and cook over medium heat to reduce, stirring frequently, until the sauce is reduced to a glossy pouring consistency. Strain the sauce into a jug for pouring onto pancakes. Keep an eye on the heat in the pan – don’t cook them over too high a heat. You want them cooked all the way through. Adjust kimchi quantity to taste. Okonomiyaki are a great ‘clear out the fridge’ dinner – you really can put just about anything in them. You can also jazz up the toppings with fried egg, pickled ginger and my favourite sprinkle, furikake. There are so many versions of okonomiyaki in Japan. This one is more or less Osaka style but they are also popular in Hiroshima where they are cooked in layers including, perhaps, eggs, oysters, pork belly and noodles. I have another version of this recipe in my first cookbook, In the Mix: Great Thermomix Recipes, thanks to then Thermomix consultant Steph Berg. Want another great cabbage recipe? Try my Peanut Butter Coleslaw.